The Rockport Film Review: You Should Watch This Movie "While Were Young"
Premiering in limited theaters in April of 2015 writer/director Noah Baumbach's latest is a sort of companion piece to his 2010 film "Greenberg". Both starring Ben Stiller as a man refusing to accept his age and place in life. This time he's playing Josh a documentary filmmaker and teacher who is in a bit of a rut when it comes to finishing his long-gestating project. Josh's wife Cornelia, played by Naomi Watts, has a father who is a very successful documentarian himself. Being very goal oriented Josh wants to make it on his own and has always pushed back when offered help. Although his current project has gone unfinished for past 10 years he struggles for inspiration and motivation in the face of growing older. During one of his classes he teaches at a local college two young people show interest in him and actually know of his work. 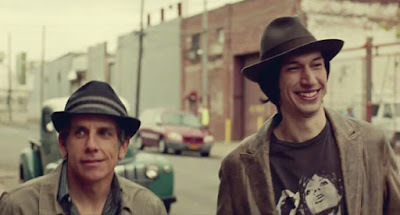 Enter Jamie and Darby, played by Adam Driver and Amanda Seyfried, the two ultra-hip 25-year-olds bring Josh back to a time when things were optimistic and full of hope. In no time flat the two couple are out to dinner and Josh and Cornelia become infatuated with the young people. Jaime is also a documentarian who is motivated and has ideas while Darby makes and sell her own brand of ice cream. These two are such yuppie hipsters its pretty unreal, they are like caricatures. Josh and Cornelia have friends their own age but feel alienated since they don't have a baby. They are that couple, although it not for lack of trying, Cornelia has had problems in the past and they are both busy with their careers. They are hooked on Jaime and Darby like a drug, as they start seeing them every chance they get. They even start acting and dressing like them. Why wouldn't people in there mid 40's want to be 25 again? The film is chock full of comments on modern relationships that are right on. Baumbach's strength as a filmmaker is finding the honest and real moments in his characters. Josh and Cornelia are obviously getting in over their heads in trying to act younger. They take part in this strange new age ritual involving a shaman and puke buckets. Enough said as it has to be seen. This is also a point that tests their relationship as Cornelia mistakenly makes out with Jaime or was it? After a while, Josh begins to suspect that Jaime has ulterior motives and could have been playing him from the start. This brings us to another big message in the storyline. The problem of youth and ethics. Although Jaime wants to be the next great documentarian he plays pretty fast and loose with the ethics behind it all, whether it's in his work or his own life. Is this new generation willing to do anything to make it big? but hasn't this been happening in Hollywood forever? Where is the line and how do you define your personal and professional ethics? In the end, what is going to win out entertainment value or truth? This was a good film and fits together nicely with "Greenberg". Ben Stiller is underrated as an actor sometimes he just needs a good script and a good director and he has found one with Noah Baumbach.